WASHINGTON — Republicans are preparing to release the framework of their tax reform proposal on Wednesday, the result of months of work by congressional leaders and the Trump administration. Early details obtained by NBC News reveal that the large tax breaks for corporations and individuals will be an expensive endeavor. President Donald Trump met with members of the tax-writing House Ways and Means Committee at the White House on Tuesday before the highly anticipated release of the outline, a top item on the GOP agenda that has taken on even more urgency in the wake of the party's inability to pass health care reform. "We will cut taxes tremendously for the middle class — not just a little bit, but tremendously," Trump told reporters ahead of the meeting. The broad outline, which is unlikely to be a complete picture on proposed tax policy, is expected to be released Wednesday after Republican members meet with Vice President Mike Pence to discuss the specifics. While those details could change, as Republicans continue to work on the outline, the plan is expected to propose a corporate tax rate of around 20 percent, higher than the 15 percent Trump wanted but a substantial drop from the current 35 percent rate, according to details shared with NBC News from an financial industry lobbyist. The current tax brackets for individuals are expected to be pared down to as few as three, with the highest bracket to be lowered to 35 percent. The lower two tax brackets will be 10 percent and 25 percent, according to this source. The seven current tax brackets range from 10 percent to 39.5 percent. While the deductions on mortgage interest and charitable donations will remain, the standard deduction will double. The plan is also expected to eliminate the deduction for state and local taxes, a deduction that primarily benefits residents of large high-tax states dominated by Democrats, including California, Illinois, New Jersey and New York. And Trump said on Tuesday that the plan would double the child tax credit, which is a big priority for his daughter and adviser Ivanka Trump. Rep. Brian Higgins, D-N.Y., who attended the meeting Tuesday with Trump, said Trump is extremely disappointed with Republican leaders and their inability to repeal Obamacare, which he said has added to the president's focus on passing tax reform. Higgins said Trump reiterated his commitment to focusing on economic growth and middle-class tax cuts. "He deals in generalities. He deals in outcomes," Higgins told NBC News. "I don¹t think he's tied to an ideological pathway to get there." Cathy Koch, a tax expert with the accounting firm Ernst & Young, said that any outline released Wednesday won't provide a complete picture of the Republican tax plan. "You’re not going to put a part on the car that doesn’t fit," Koch said. "The question is, Do you like all the parts on the car? And that is going to be a matter of political taste." Republicans also plan to fulfill a long-held goal of repealing the estate tax, a tax on property passed on to heirs that is paid only by the very wealthy. “There’s a lot of appetite on the Republican side" for repealing the estate tax, Rep. Tom Reed, R-N.Y., a member of the Ways and Means Committee, said before the meeting at the White House. "We’re hoping to advance our agenda, and that’s one of our key platform positions." If these tax cuts are all part of the GOP plan, some estimates show that it would cost upward of $4 trillion. The high cost, however, could complicate efforts to move it through Congress. An agreement was reached in the Senate to pass a $1.5 trillion budget plan, which is necessary to move on to tax reform. Some fiscal hawks are concerned about passing a massive tax plan and relying mostly on anticipated economic growth to fulfill the budget gap. Trump told dinner guests from conservative groups on Monday night that he expects the House will approve a tax bill next month and the Senate by December. One person described the president as “optimistic” about that timeline. Republican leaders in Congress were equally sanguine. 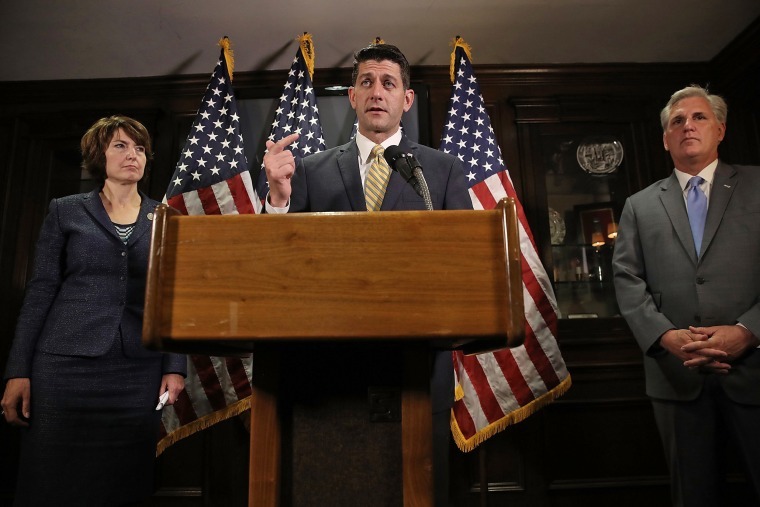 "Tax reform is the most important thing we can do to restore confidence to this country, to get jobs and prosperity," House Speaker Paul Ryan said at a news conference Tuesday morning. "And that is why we are so singularly focused on getting this done this year."